A few predictable jokes later, ‘Kanye’s’ metaphors and inspirational sayings had the crowd in tears. It was quick witted and straight to the point. It’s hard to believe that these actors aren’t the real deal, as the way they play their roles, is spot on. 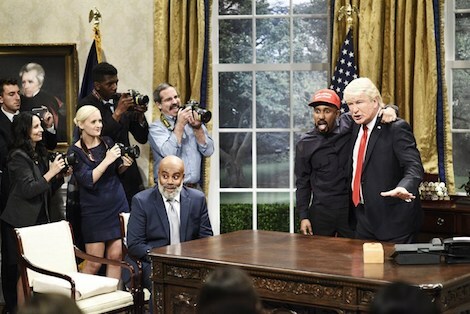 After this sketch, Kanye and Trump are officially basted, roasted and burned. From Chris Redd saying ‘Let me put in my passcode. 0-0-0-0-0-0, I’m a genius!” to Alec Baldwin mocking Trump’s thoughts by adding, ‘Wow this guy can talk…he doesn’t listen to anyone but himself, who does he remind me of?” It’s a constant dig at the question – who is more mind numbingly stupid? It was hilarious from start to finish and probably one of the best Saturday Night Live sketches I’ve seen. Spot on, SNL! Do you think SNL’s sketch was hilarious or silly? Do you reckon they hit the nail on the head? Let us know in the comments, or on Twitter at @WhatsTrending. Royal Stalk Watch: Meghan Markle and Prince Harry Are Expecting!